When the path of these space rocks intersects with Earth's orbit, the meteoroid enters the atmosphere at high velocity causing the luminous phenomena we call a meteor or shooting star. These meteors should not be confused with a meteor shower. Meteor showers involve the Earth passing through a comets orbit. A very bright meteor is called a fireball and may be called a bolide if associated with a smoke train and detonations (which often produces meteorites). These events can also be tremendous force of nature. The recent Russian meteor sonic boom and shock wave on February 15, 2013 caused considerable property damage and injury to people. As the meteoroid passes through the atmosphere, ablation occurs where melting and vaporization removes material from the surface. This ablation can also produce regmaglyphs which are flight marks produced during the passage of a meteoroid through the atmosphere and often look like thumbprints pushed into the surface. This melting of the exterior surface from heating due to it's high velocity through Earth's atmosphere is also what causes the fusion crust seen on the exterior of meteorites. These factors help us with meteorite identification because the exterior features of space rocks are different from that of Earth rocks. An oriented meteorite is formed when it's passage through the atmosphere is in a stable orientation. It receives the characteristic ablation features from being melted mostly on one surface. Among these features are a rounded front surface or a cone shape and often radial lines of melting in the front surface, and a rolled over lip of melted material which has cooled around the circumference of the back side. On very rare occasions large meteoroids will reach the ground with enough velocity and mass to form an impact crater. The best preserved impact crater today is Meteor Crater in Arizona. Associated with impact structures and craters is a type of rock called an impactite. This glassy rock, also called crater glass, is formed from the melting of native rocks during the impact of asteroids. A second glassy object associated with impact events but much less understood are tektites. A tektite is a natural glass object formed by the melting of native rocks during some asteroid impacts. Some tektites, the Australites, receive aerodynamic shapes as the still plastic but cooling glass falls back to the surface from very high altitude. Muong Nong tektite glass may be from a melt sheet formed near the impact site. 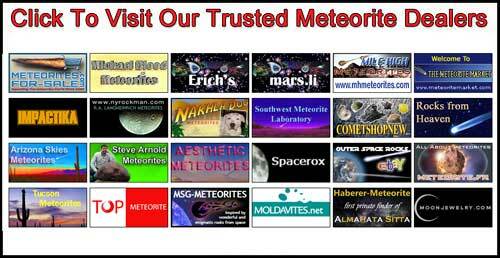 Interest in meteorites has steadily increased overtime and the meteorites below have high public interest. This list will be updated regularly. Meteorites land at random everywhere on Earth. Most land in the oceans and are not at present recovered from the water. Of those that fall on the land many are also not recovered. Meteorites often arrive in a very dramatic display with blinding light, smoke trails and thunderous detonations. The meteoroid exploding into many fragments high in the air. 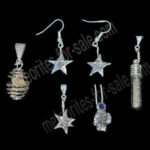 Meteorites can also arrive as individual pieces with less notice. In the past when there were no detection methods available many meteorites would go unrecovered. We can make estimates based on the meteorites found about how often large events occur. A handful of larger objects strike the Earth everyday. So many thousands of small ones hit the Earth that it grows heavier by tons of weight each day. While it is true that they fall randomly everywhere, they only survive for a long time if they fall in areas like deserts or places with only occasional rain. Meteorites almost universally contain iron which quickly deteriorates in the atmosphere of Earth. Meteorites which fall in jungles and forests will disappear into the ground cover and quickly fall apart by weathering likely never being recovered. 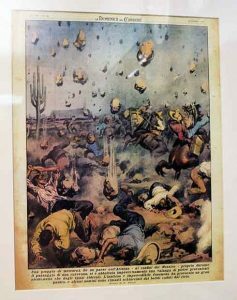 The meteorites which land in deserts will fare much better. Thousands of meteorites have been recovered in the last few decades from deserts. Many of these meteorites have been on or near the surface for thousands of years. We usually think of deserts as lethally hot locations. In actual fact deserts are defined by their rain fall amount. It happens that the frozen vastness of Antarctica is also a desert by definition since it has nearly no rainfall. It is called a cold desert. Tens of thousands of meteorites have been found on the ice or found where they have been moved by the ice. Mixed with other rocks meteorites have been found in moraine deposits formed by the glaciers. Though thousands of years old freezing has preserved them from the weathering suffered by meteorites which fall in other climates. 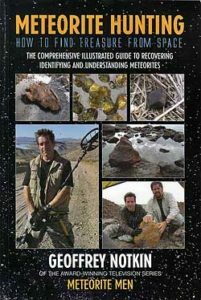 Since the first meteorites were collected and studied it has been clear that there are three basic types of meteorites. Iron Meteorites which consist of mostly iron with varying amounts of nickel. The second and most abundant group is the Stone Meteorites made up of silicate minerals with a small amount of metal grains. 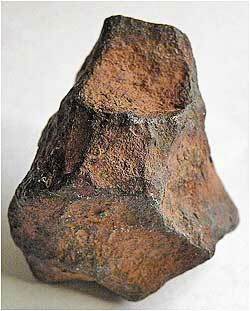 The third group is the Stony-Iron Meteorites which contain roughly half mineral and half nickel iron metal. Most are believed to originate from the asteroid belt but there are also meteorites proven to be from the Moon and Mars. Iron meteorites as the name states are composed of almost solid nickel-iron. Often there are mineral inclusions in iron meteorites, but they amount to a small percentage of the mass. Three main subgroups of irons have been recognized. They are the Octahedrites, the Hexahedrites and the Ataxites. The metal nickel is found in nearly all meteorites. It is the amount of nickel that was in the original bulk alloy that cooled in space that determined which of the three iron families a meteorite will be placed into. This difference in nickel chemistry results in a difference in crystalline appearance of the metal when acid etched and also determines even which nickel iron minerals will crystalize. In the Octahedrites both Taenite and Kamacite mineral crystals grow. In Hexahedrites only Kamacite can form. So Hexahedrites are essentially pure kamacite. The opposite is true with Ataxites where only Taenite was able to grow. Much more can be said about this but it is the size of the crystals in Octahedrites that determines a meteorite's placement in the next level of classification. Low nickel Octahedrites will have large crystals and are call Coarse Octahedrites, middle level nickel percentages will result in what are called Medium Octahedrites, and iron meteorites that formed where there was a higher amount of nickel will have tiny crystals and are called Fine Octahedrites. The largest group of meteorites by far is the stony meteorites. Made of minerals that for the most part are the same as minerals that are found on Earth. However,they have structures and textures not found here. The stony meteorite group is divided into two major subgroups; the chondrites and the achondrites. The	chondrites get their name because of the spherical mineral structures they contain called chondrules. In space the molten droplets of rock material cooled in the very low gravity into tiny round spheres that crystallized into minerals. Achondrites are stony meteorites without chondrules. These meteorites have an igneous mineral structure with crystals that indicate they formed in an environment with some gravity. In most stony meteorites there is metallic nickel-iron. The metal is in the form of grains scattered throughout the matrix of the rock. The Stony-Iron meteorites are made of both nickel iron metal and stone and this group includes two large sub groups, the pallasites and the mesosiderites. The Pallasites are characterized by having a large portion of their mass in the form of olivine crystals with these crystals being surrounded by nickel-iron. Mesosiderites have silicate minerals found commonly in many iron meteorites but the amount of silicates gets quite high resulting in these meteorites classified as mesosiderites. 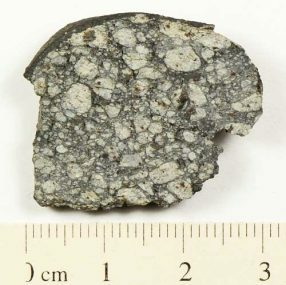 Lunar meteorites are mostly volcanic rocks called basalts. Over time the impacts on the Moon have broken the rocks into fragments that have been melted and reformed into rocks called breccias. Lunar meteorites will often show small individual areas of different colors that make up these breccias and are called clasts. Moon rocks are very old. Volcanic activity is believed to have stopped early in the Moon's history. Mars meteorites can be broken down into three distinct groups. They are Shergotty, Nakhla, and Chassigny which form a grouplet of planetary meteorites know as the SNC group. Scientists have proven that these meteorites came from Mars by comparing the trapped Martian atmosphere in the meteorites compared with the measurements of the Martan atmosphere by the NASA Viking spacecraft that landed on Mars in 1976.